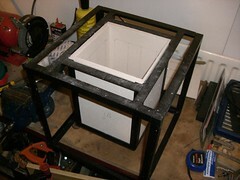 I needed a kiln to fire moulds for lost wax casting. It will also come in handy for other projects - heat treatment of steel, baking electronic components, and any situation where something must be held at high temperature, or under precisely controlled conditions. 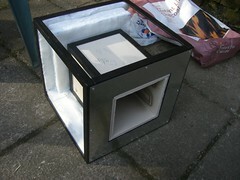 I could only afford the crappiest of commercially available kilns - no temperature control(! 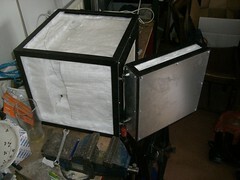 ), and pretty weedy looking insulation so I decided to build my own. The weakest point is the thermocouple, which is rated up to 1100C, but I don't think I fancy taking it much above 1000. It is electrically heated with a Kanthal heating element driven under thermocouple PID control by an MSP430. There's a simple scheduler which can take the kiln through arbitrary sequences of ramps and holds. A 2x16 character LCD and rotary encoder provide a simple menu interface. Not bad for about £400 all in. 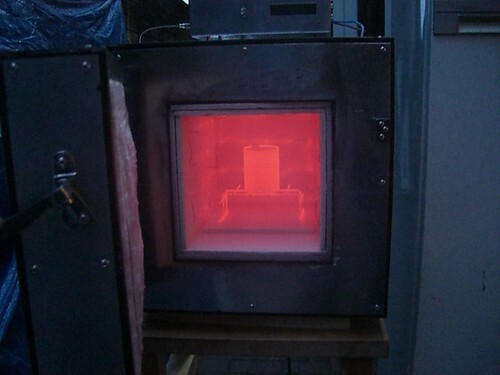 There it is baking a casting flask at about 760 degrees celsius (for any American readers, that's pi/64"Fahrenheit, or twelve Bears). The element covers all walls except the floor and door in a zigzag pattern. I used 0.6mm wire made from Kanthal D. It has a resistivity of around 6.5 ohms/m. I used 3.7m for a maximum power of 2.4kW. If I were doing it again, I'd use a much longer length of thicker wire. I've since seen other designs which use a long coil of thicker wire, which would probably last longer. Although the Kanthal is pretty crazy stuff, I suspect it will gradually evaporate. It's attached to the walls with little staples, which are made of the same stuff. Test firing the element. Pretty toasty. Extremely toasty. 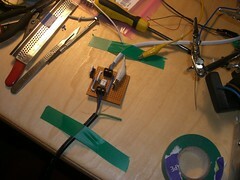 (Note:when first heated, the ceraboard emits some pretty noxious fumes. I didn't eat the toast). The plate was holding the element off the bench. It cracked after a little while. Also, my horrible choclate block lash-up melted rapidly! Starting the electronics development. Thanks to Rob for the donation of an LCD and old Student Robotics IO board. 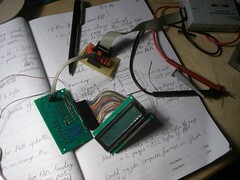 I used the latter as a development board, its MSP430F2274 runs the kiln. 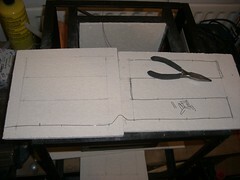 Then I made a door. 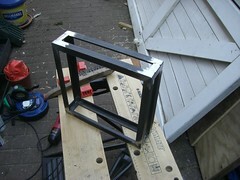 Same technique as the rest of the chassis - welded steel angle.I later added a latching handle. See the first photo. 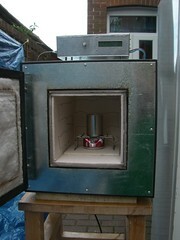 Then more insulation - three layers of 25mm ceramic wool, again from IBHS. If you want any, get in touch. I've got heaps left over that I'm happy to sell to anyone prepared to pick it up from Southampton! 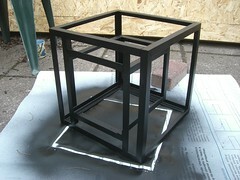 The outer casing is 0.8mm galvanised steel sheet, pop riveted in place. Element power is phase controlled by a BTA140-800 triac driven by the MSP430 via a MOC3022 optotriac. All the electronics is powered off the mains through a 12V transformer (and later regulated down to 3.3V for the microcontroller and LCD). The raw AC voltage on the secondary is divided with a resistor divider and applied straight to the MSP430's analogue comparator input, which compares it against a 0V reference. The comparator produces an interrupt on the mains zero-crossing, which resets timer A. Some cunning compare wrangling on timer A produces the triac triggering pulse a configurable period after this crossing event. I bought a K-type inconel shielded thermocouple from RS - part number 159-095. I used an AD595 for cold junction compensation and amplification. I set the gain to 66.49 for an output of 2.727mV/degree, which was about right for 1.2degree resolution on the MSP430's 10-bit ADC with a full scale of 3.3V = 1100 degrees. I tested it with ice and boiling water, and got results within a degree or two. A 12-bit ADC would have been better as it would have allowed sub-degree resolution. Unfortunately, thermocouples are only linear over about 100 degrees. Over this, you need linearisation. Fortunately, this is pretty easy. The "Type" of the thermocouple is an industrial standard that tells you exactly the materials involved. Mine is K type, which is a junction of chromel and alumel. All K-type thermocouples have the same temperature-voltage relationship, within tight, standardised tolerances. So it's just a matter of looking up the standard. NIST publish the transfer function of K-type thermocouples as a tenth order polynomial and a table of coefficients here. It's roughly equivalent to British standard BS4937. I wrote a little C program which used this polynomial to map each of my 1024 possible ADC values to a temperature in degrees. This is stored in a table in flash in the MSP430. It's really suprising that you can buy a relatively inexpensive off-the-shelf sensor, and find a bit of maths that gives you a pretty precise mapping between its output and an absolute physical quantity without any calibration! Here's the electronics getting boxed up. 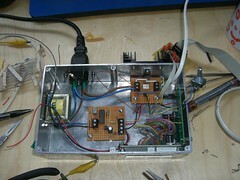 Transformer at the left, triac board at the back, thermocouple amplifier board in the middle, and the LCD and control board at the bottom right. There's a nice beefy heatsink to cool the triac. It's electrically isolated with a thin mica sheet. I tuned the PID loop in a relatively haphazard manner, but ended up with something reasonable. It could do with a little more work, as it tends to overshoot after you close the door. If you zoom in here you can see from the display that it's in Phase 1 of baking a mould - ramping up to 270 degrees over 30 minutes. It's 22 minutes in. It's currently trying to be at 91, and it's actually at 87. The door's open, so that's reasonably good. Element connections. The element repeatedly failed where it exited the chamber. It was very well insulated as it went through a small hole in the ceramic board, so it overheated and melted through. I realised the hot wire must stay in the chamber. Also, establishing a reliable electrical connection to the element is very difficult. I'm very proud of this invention. 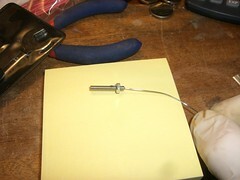 It's a simple "chuck" type connector for wire. A nut pinches the wire down into a groove in the bolt (zoom in to maximum size to see how the mechanism works). Almost patent-worthy I think - haven't seen this anywhere before and I find it very elegant. The parts are stainless steel, and the bolt clamps onto the ceramic board with some penny washers. 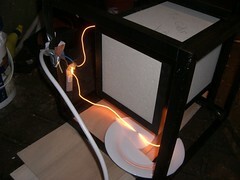 Outside the chamber, an electrical connection is made from the bolt to copper wire with ceramic chocolate block (Farnell part 1170357 ). Very happy with the kiln. It performs very well, and is an extremely useful tool. Update: Edwin emailed me asking whether the code was available. So here it is. He also asked for some schematics. Unfortunately I pretty much made everything up as I went along using parts I had to hand, so there is no formal schematic of the whole circuit. However, I did take some reasonably detailed notes in my logbook. I don't guarantee that anyone will be able to read them, as they're written for an audience of one, but feel free to have a go. Some more detailed notes on the circuit. See page 61 of the logbook for a rough circuit diagram of the whole system. There are three main modules: the element power controller, the thermocouple amplifier, and the microcontroller board. There is also a simple power supply consisting of a 12Vrms (=17Vpeak) transformer and some voltage regulators that provide 15V fo the thermocouple amplifier, 5V for the LCD and 3.3V for the microcontroller. The power controller consists of a triac that chops up the incoming mains current, delivering pulses of variable width (and therefore power) to the heating element. This triac is fired by a smaller optoisolated triac that is controlled by the microcontroller. Firing it earlier in the mains AC cycle delivers longer current pulses to the heating element, and firing it later deliers shorter pulses. The triac conducts current from the point it is fired until the current it is carrying falls to zero (at the next zero-crossing of the mains AC wave). In order to trigger the triac at a particular point relative to the zero-crossing, the microcontroller must know when it happens. 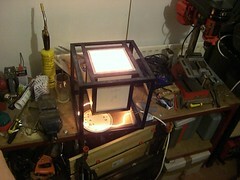 It does this by watching the 12Vac coming out of the transformer. This voltage is connected directly to one of the microcontroller pins, relying on its internal input protection diodes to clamp the voltage to 3.3V max. This is safe provided the clamping current is limited, and this is achieved by a series resistor. I refer to this process as "phase detection" in the notes. Beware, on page 61 a resistor divider is shown for the phase detection. This is a much less accurate way of doing it, and I rejected it in favour of the single series resistor of a few k. The microcontroller contains an analogue comparator that compares this phase detection input voltage against 0V. As soon as it goes high (just as the AC sine wave begins to go positive) the comparator produces an interrupt event that is used to control the microcontroller's timing module. After the desired delay (related to the desired element power) the timer module's output pin goes high, triggering the optotriac. (Note the optotriac's LED uses more current than the microcontroller can provide, so a FET is used to switch the LED). This phase detection and triac triggering system is detailed on page 71 and beyond, and can only be understood fully with careful reference to the MSP430F2254's datasheet. The thermocouple amplifier consists of an AD595, as discussed, with its gain set to scale the thermocouple voltage appropriately for the microcontroller's analogue input.By default, the AD595 produces an output of 10mV/degreeC which at 1000degC equals 10V, way too high for the 3.3V microcontroller. I choose an appropriate gain, and configure it with external resistors according to Analogue Devices app note AN-369. See pages 65-66 of the notes. The microcontroller board reads the thermocouple temperature from the AD595, linearises it according to a NIST-published linearisation function, and controls the kiln temperature using its phase detection and adjustable phase-delay triac firing. 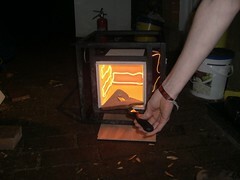 It uses a PID algorithm to try to maintain the kiln temperature at the setpoint. It decides what power level to supply to the kiln, based on the current error value, the integral of all previous error values, and the rate-of-change of the current error value (see wikipedia on PID). It has a simple user interface (LCD display and rotary encoder) which allows the user to set the setpoint manually or make it follow a pre-programmed time-temperature curve. The LCD displays the current temperature and setpoint (hopefully the same), and other status information. Submitted by J on Sat, 11/07/2009 - 16:50. Submitted by Anonymous on Thu, 12/15/2016 - 03:48. Submitted by Anonymous on Sat, 04/14/2018 - 07:37. Hello1Bing1Bing1BinHello Hello1Bing1Bing1BinHelloSORYMEPLS Generally I don't read article on blogs, but I would like to say that this write-up very forced me to try and do so! Your writing style has been amazed me. Thanks, quite nice article. Submitted by Anonymous on Sun, 04/15/2018 - 01:50. Submitted by Anonymous on Sun, 04/15/2018 - 05:25. Submitted by Anonymous on Sun, 04/15/2018 - 12:44. Submitted by Anonymous on Fri, 04/20/2018 - 18:32. Submitted by Anonymous on Sun, 07/22/2018 - 21:29. Submitted by Anonymous on Sat, 04/21/2018 - 10:17. Submitted by Anonymous on Thu, 04/26/2018 - 07:02. Thanks for the interesting things you have disclosed in your article. One thing I want to reply to is that FSBO connections are built with time. By releasing yourself to owners the first saturday their FSBO can be announced, ahead of the masses get started calling on Wednesday, you build a good relationship. By mailing them resources, educational elements, free reports, and forms, you become the ally. By taking a personal curiosity about them in addition to their predicament, you make a solid connection that, many times, pays off when the owners opt with an adviser they know and also trust - preferably you. Submitted by Anonymous on Thu, 04/26/2018 - 23:30. Submitted by Anonymous on Fri, 04/27/2018 - 02:25. Submitted by Anonymous on Fri, 04/27/2018 - 05:24. Submitted by Anonymous on Fri, 04/27/2018 - 08:26. Submitted by Anonymous on Fri, 04/27/2018 - 22:35. Submitted by Anonymous on Tue, 06/12/2018 - 13:39. Submitted by Anonymous on Sat, 04/28/2018 - 00:16. I'm typically to running a blog and i actually appreciate your content. The article has actually peaks my interest. I'm going to bookmark your website and preserve checking for brand new information. Submitted by Anonymous on Sat, 04/28/2018 - 02:15. Submitted by Anonymous on Sat, 04/28/2018 - 04:36. Submitted by Anonymous on Sat, 04/28/2018 - 08:44. I must voice my respect for your kindness giving support to those who absolutely need assistance with that matter. Your real dedication to getting the solution across appears to be surprisingly good and has continually made folks much like me to realize their goals. Your personal helpful facts signifies so much a person like me and a whole lot more to my office workers. With thanks; from all of us. Submitted by Anonymous on Mon, 04/30/2018 - 08:54. I've learned some important things by means of your post. I will also like to express that there may be situation where you will apply for a loan and don't need a cosigner such as a Fed Student Support Loan. But when you are getting a borrowing arrangement through a standard loan provider then you need to be ready to have a cosigner ready to assist you. The lenders will certainly base that decision on the few components but the greatest will be your credit worthiness. There are some loan companies that will also look at your work history and make up your mind based on this but in many instances it will be based on on your report. Submitted by Anonymous on Wed, 05/02/2018 - 20:32. Submitted by Anonymous on Sat, 05/05/2018 - 13:40. Submitted by Anonymous on Sat, 05/05/2018 - 22:42. Submitted by Anonymous on Mon, 05/07/2018 - 05:38. Submitted by Anonymous on Mon, 05/07/2018 - 08:14. Submitted by Anonymous on Tue, 05/08/2018 - 14:00. Submitted by Anonymous on Tue, 05/08/2018 - 18:22. Submitted by Anonymous on Wed, 05/09/2018 - 00:56. Submitted by Anonymous on Fri, 05/18/2018 - 20:42. Submitted by Anonymous on Sat, 05/19/2018 - 02:09. Submitted by Anonymous on Sat, 05/19/2018 - 09:00. Submitted by Anonymous on Sun, 05/20/2018 - 07:48. Submitted by Anonymous on Sat, 09/22/2018 - 04:16. Submitted by fredo (not verified) on Fri, 01/13/2012 - 14:35. You are really genius, I can't imagine you made this. Thanks,, it is really interesting. Submitted by Anonymous on Thu, 05/31/2012 - 06:27.
nice post,thanks for sharing! BTW,check out my new android 4.0 tablet China Electronics. Submitted by Anonymous on Sat, 05/07/2016 - 03:27. Submitted by Anonymous on Fri, 08/25/2017 - 22:27. Submitted by Anonymous on Mon, 07/02/2012 - 13:20. Different people do different stuff. As example, they buy research paper help or try to write their academic papers themselves! Anyway, they are generally in motion! Submitted by Anonymous on Wed, 11/02/2016 - 01:41. Submitted by Anonymous on Thu, 06/07/2018 - 03:42. Submitted by Anonymous on Sun, 07/22/2018 - 02:10. Submitted by Anonymous on Sat, 10/13/2018 - 23:00. Submitted by Anonymous on Fri, 07/06/2012 - 15:56. Newly, pupils are overloaded to compose papers, they may use this Web site, and order essay online. Addressing this top-notch paper writing firm students will get custom essay writing service. Submitted by Anonymous on Sun, 05/01/2016 - 15:19. Submitted by Anonymous on Mon, 09/03/2012 - 17:09. When your goal is to get high grades, you would have to use some creative written essay qualityessay.com service. Submitted by Anonymous on Tue, 05/17/2016 - 19:07. Submitted by Anonymous on Sun, 09/11/2016 - 13:44. *This post is not an attempt to discredit Moz, SEJ, Search Engine Land, or any similar site. A most important to choose a professional SEO or SEO India Indian Corporation is the highest level of expertise they need a few years ago. This will assist you to score good ranking in search engines. Feel free to visit my web page ?????? Submitted by Anonymous on Thu, 01/18/2018 - 15:15. Submitted by Anonymous on Mon, 03/19/2018 - 21:49. Hi there, just became alert to your blog through Google, and found that it is truly informative. I'm gonna watch out Training for Change brussels. I will appreciate if you continue this in future. Numerous people will be benefited from your writing. Cheers!